From Amber to Chopin, from Borsch to Vistula, this photographic alphabet celebrates everything Polish people love best about Poland. Set in the heart of Europe and full of lakes, forests and mountains, the country has wild animals which have disappeared from the rest of Europe. Polish history and folk traditions, its storytelling and cooking all combine to make a special way of life that Polish people take with them wherever they go. P Is For Poland is a great introduction to the wonders of Poland. 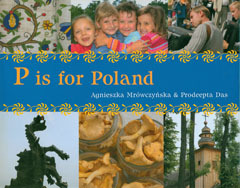 P Is For Poland by Agnieszka Mrowczynska & Prodeepta Das is available to buy now.